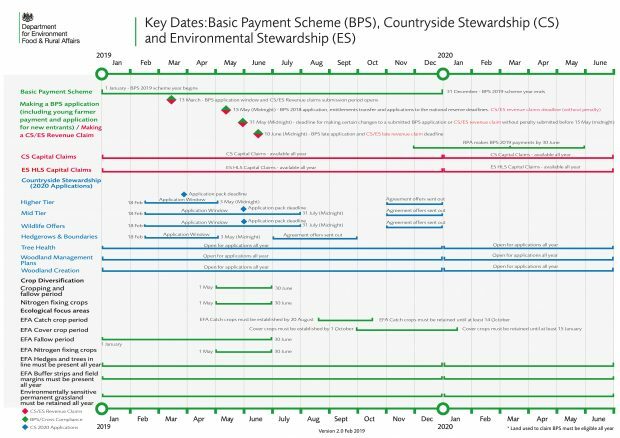 It shows you important dates in 2019 for all three schemes (BPS, CS and ES), ahead of the full scheme rules and guidance being published. We’ve also included some of the things that you need to do to meet the cross compliance and Ecological Focus Area (EFA)/greening requirements of your application(s). Why not add these dates to your calendar now? You could also add a reminder, if you save them electronically, so that you don’t forget them. Open the ‘Key dates for 2019’ PDF now. You can also print this off or save it on your computer. We were hoping that the timeline would show when payments should have/will be paid for the Countryside Stewardship. Thanks for your feedback. We'll pass this on to our operational teams. Would be good to have it in a download to calendar format. Hi James, thanks for your suggestion. This is something we'll investigate to see if we can make this available in the future.